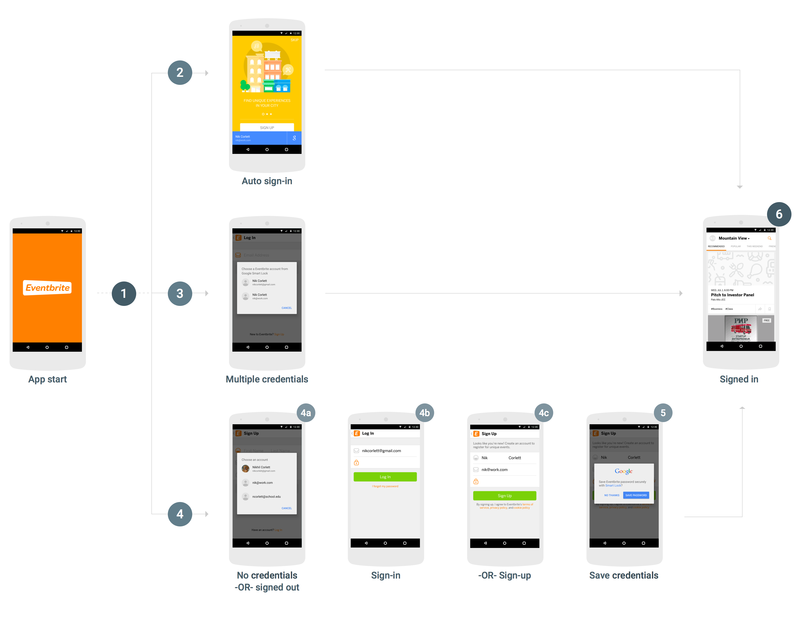 To integrate Smart Lock for Passwords into your Android app, you must add calls to the Credentials API to your app's start-up and sign-in flow. The following diagram shows the flow of a typical Android app that uses Smart Lock for Passwords. Existing users of your service that have a single credential saved are immediately signed in, and they will go directly to the signed-in view when they open the app. Users that have multiple credentials saved or that have disabled automatic sign-in need to respond to only one dialog before they go to the app's signed-in view. Users that have no saved credentials or haven't signed up yet can pick their name and email with a single tap and be intelligently sent to either the sign-in or sign-up view, with this information pre-filled. When users sign out, the app ensures they are not automatically signed back in. When the app starts, if no user is already signed in, call CredentialsClient.request(). If the Task is successful, get the user's credentials with getResult().getCredential() and use them to sign in. If the Task fails and the exception is an instance of ResolvableApiException and getStatusCode() returns RESOLUTION_REQUIRED, user input is required to pick a credential. Call startResolutionForResult() to prompt the user to select a saved account, then call getParcelableExtra(Credential.EXTRA_KEY) to get the user's credentials and use them to sign in. If signing in with the retrieved credentials fails because the password is incorrect or the account doesn't exist, delete the credentials from Smart Lock with CredentialsClient.delete(). If the Task fails with an ApiException and getStatusCode() returns SIGN_IN_REQUIRED, the user has no saved credentials and must sign in or sign up manually using your current sign-in or sign-up flow. After the user successfully completes sign in, you can provide an opportunity for the user to save their credentials for future retrieval (step 5). You can help the user sign in or sign up faster and more easily by retrieving sign-in hints, such as the user's email address. The user can select the hint and skip typing their credentials. If your app requires users to sign in, you might choose to retrieve hints immediately after the initial credentials request fails (otherwise, you can wait until the user starts the sign-in or sign-up flow). Call CredentialsClient.getHintPickerIntent() and start the intent to prompt the user to select an account, then call getParcelableExtra(Credential.EXTRA_KEY) to get the sign-in hint. If the user ID of the hint matches an existing user, pre-fill the sign-in form with it and let the user enter the password to sign in. If the user ID of the hint doesn't match an existing user, pre-fill the sign-up form with the user's ID and name, and let the user create a new account. After the user successfully signs in or creates an account, save the user ID and password with CredentialsClient.save(). If the user signed in with a federated identity provider such as Google Sign-In, create the Credential object with the user's email address as the ID and specify the identity provider with setAccountType. When the user signs out, call CredentialsClient.disableAutoSignIn() to prevent the user from being immediately signed back in. Disabling auto-sign-in also enables users to switch between accounts easily—for example, between work and personal accounts, or between accounts on shared devices—without having to re-enter their sign-in information. Ready to integrate Smart Lock for Passwords into your app? Get started. Last updated June 28, 2018.